Ko te aronga matua o te Tarati Sustainable Whanganui kia arahina te hāpori hei rūnanga manawaroa: kia tuku koha rangatira, he taonga whai take, kia tuku tōmua hoki ko ngā kōrero whakatohutohu, kia awhi, kia tū ora ai te iwi. E hiahia ana te Tarati o Sustainable Whanganui kia rongonui ai a Whanganui ki te mapi o te motu, i roto i te manaaki hāpori, kia auahatia, kia whai take whakatika mo te kaupapa tū ora. I puāwai a Sustainable Whanganui hei tarati manaaki i te mārama o Haratua 2008, i ngā tau mua mai, i te pakari tonu te rōpū nei i roto i tōnā whanaketanga. Mo ngā tūranga o te tarati, tekau ngā kaitarati, tokowhā ngā kaitohu. We LOVE our other Volunteers as well who we call WhEBsters. They keep the WhEB office and ReUse Academy rooms open, stocked and tidy(ish) and also help at events and on projects out in the community. Some of our Volunteers are in the WhEB office for a four hour rostered shift once a week, and others come in for an hour or so when they have time. We’re flexible like that. We offer induction training for new Volunteers and they can buddy with a more experienced Volunteer until they feel confident to go solo in the office. Kia toitū te taiao, te mana tāngata, te mana taonga me ngā hononga hāpori kei roto i te rohe o Whanganui. Kia whakareri, kia whakapūtake te hāpori, hei rūnanga hihiri, hei manawaroa, kia tū ora rawa ahakoa ko ngā tohu taumaha o te pūngao, te āhuarangi me ngā take ahupūtea i takea mai i ngā kaupapa i kite atu, ko te hinu mimiti me ngā huringa āhuarangi o te ao. Kia whakawhanake ai he whare rauemi taiao whare ako. Kia tautoko māngai atu i ngā take taiao tū ora, mana tāngata, mana taonga me ngā mahi hononga hāpori. Kia arahina te whāngaitanga o te kaupapa toitū te ora i roto i te hāpori. Kia whakatairanga i ngā mātauranga taiao. Kia whāngai māramatanga mo ngā take ahupūtea, whakawhānaungatanga, tōrangapū, tū ora hauropi hoki ki ngā takiwa taiwhenua, taitaone hoki o Whanganui. Kia hono ā rohe, ā motu, puta noa hoki i te ao. Kia maumaharatia te kaitiakitanga o ngā tāngata whenua; kia whai i ngā tikanga kākanorua, kākanomaha hoki, hei rongoā mo ngā take taiao ā rohe; kia manaaki i ngā kawekawe me ngā tāngata o te ao, kia awhi tautoko pēnei tonu te tikanga. Providing any other support and assistance consistent with this charitable purpose. In 2006 a passionate and committed group of people came together realising that sustainability and resilience for our community was becoming increasingly important. The group included an engineer, organic gardeners, a teacher and a regional councillor who became Mayor. From these first discussions Sustainable Whanganui (SW) has spread its sphere of influence across our community. There are many ways in which our group of committed volunteers connects with our community — Green Bikes, Fruit Trees in Schools, ReUse Academy, Zero Waste, Adopt-A-Plot, Sustainable Schools, school holiday programmes, community art and craft programmes, festivals and events such as Earth Day and our popular Feijoabulous Festival. Over the years SW has hosted many educational talks and films and there has been a range of hands-on, practical workshops like composting, cloth-bagmaking and more. In 2011 Sustainable Whanganui saw a need and suggested the establishment of a resource recovery centre to the Whanganui District Council. Their vision included more than just recycling. Happily, this found a receptive audience at Council which was interested in creating partnerships for progress. A perfect central site was identified: the former Whanganui gaol, which was land-banked and thereby offered the chance to partner with Whanganui iwi, and recycle and reuse a whole prison site! Sustainable Whanganui had manifested a new environment centre, known as the Whanganui Environment Base (WhEB for short) and promptly set up the ReUse Academy (RUA) rooms. Sustainable Whanganui is well-connected around our region: in addition to the more than 60 schools/kura/ECEs that Fruit Trees in Schools works with, we can add twice that many local and national businesses and community organisations. 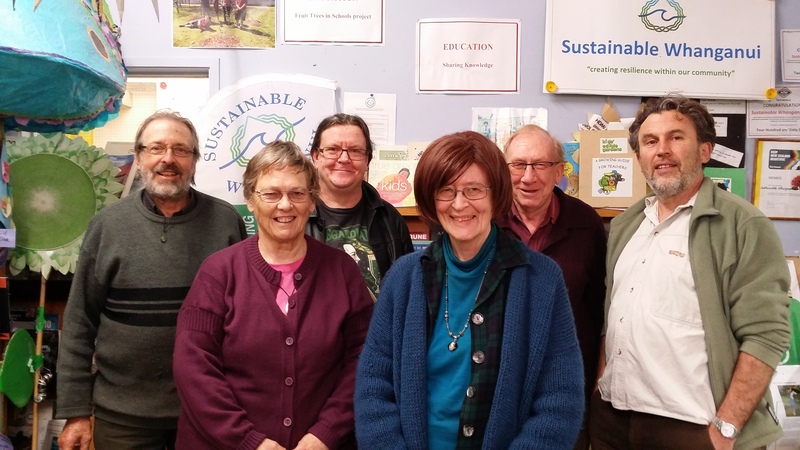 Sustainable Whanganui shares information on upcoming events, interesting articles and links via a Google Group as well as Facebook and Instagram. We let people know what we’re up to and what’s happening environmentally and sustainably through the Sustainable Whanganui Google Group which has 300+ subscribers, as well as Facebook (1000+ followers), and Instagram posts.